SpringPublisher Pro 2.5.5 was available as a giveaway on April 17, 2012! SpringPublisher is a professional and easy to use desktop publishing software. With its included various templates and online template store, powerful multi-layer editor, detailed help-files, Spring Publisher enables you to design and print Business Card, Flyer, Postcard, Letterhead and other artworks within a few minutes. 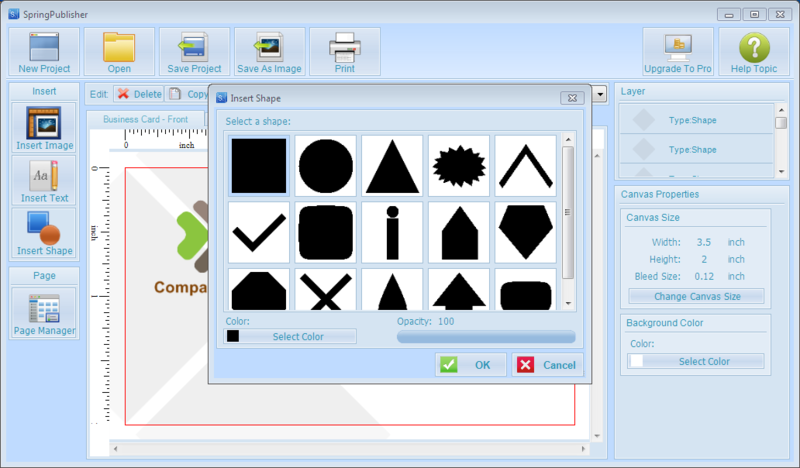 Enables you to add images, texts, QR code, maps, vector shapes, logos and arrange them as you like. Provides various image effect: shadows, opacity, rotation, etc. Allows you to download high quality templates from the template store. Makes it easy for you to print your artworks either with your own printer or in professional print shops. Generates high resolution artwork with a maximum output of 350dpi. Supports Avery and Printworks micro perforated paper that enables you to create business cards and postcards more easily. This version comes with a set of templates. Please download here. How would you improve SpringPublisher Pro 2.5.5? Include a free section on your site for extra templates seeing as the ones you provide are inaccessible without a full licence. The giveaway licence doesn't work. When downloading extra templates from the web it asks for the licence code, the code we are provided does not appear to work. Include instructions on how to install the extra templates. Copying over the extra templates does not appear to allow access from the opened program???? @70 - I installed this program on both Win XP and Win 7 systems. Went back after reading your post about MyBabylon being placed on your system. Not anywhere after my installs on either system. It came from some other install on your system. Pay better attention to what you install in the future so you can place the blame where it should be. It had nothing to do with GAOTD or spring publisher. @70 - I installed this program on both Win XP and Win 7 systems. Went back after reading your post about MyBabylon being placed on your system. Not anywhere after my installs on either system. It came from some other install on your system. Pay better attention to what you install in the future so you can place the blame where it should be. It had nothing to do with GAOTD or spring publisher. To all those who have suggested Microsoft Word as an alternative I ask the question. WHEN DID IT BECOME FREE!!! To all those who have suggested Microsoft Word as an alternative I ask the question. <b>WHEN DID IT BECOME FREE!!! This file is not malware, does not install malware, it's safe and will only install if you execute the file but it was not mentioned as being part of this GOTD. This should have been mentioned! I don't appreciate an unknown application installer being placed on my computer without my specific knowledge and permission. Therefore, whether or not the software it installs is good or bad is irrelevant. The fact that it was covertly placed on my machine without my knowledge or permission is BAD. This is NOT what I expect from GOTD. Otherwise, I like today's giveaway software as mentioned in a previous post. I just don't like the sneaky way that another application installer was placed in the program files. In the program folder I just happened to notice an executable file named MyBabylonTB.exe This is a file that installs a babylon9 toolbar, a 'translation toolbar' version 9.0.3.21 as described on the Babylon website here: http://www.babylon.com/ This file is not malware, does not install malware, it's safe and will only install if you execute the file but it was not mentioned as being part of this GOTD. This should have been mentioned! I don't appreciate an unknown application installer being placed on my computer without my specific knowledge and permission. Therefore, whether or not the software it installs is good or bad is irrelevant. The fact that it was covertly placed on my machine without my knowledge or permission is BAD. This is NOT what I expect from GOTD. Otherwise, I like today's giveaway software as mentioned in a previous post. I just don't like the sneaky way that another application installer was placed in the program files. Thank you! #38 answer (apparently) is that I had a prior version of this program, from a previous giveaway sometime in the past year, which I had duly uninstalled before starting to install this newer edition and sort of forgotten about, until I realized that what the new version must (out of necessity) be doing is reading some scrap left in the registry or somewhere else by the previous edition that undoubtedly contained vital information about the software such as its registration code. So the net result is that this latest revised revision activated itself off of the old uninstalled copy's stored registration code, it would appear. If it gave me a way to directly check its status, I would have gotten to this conclusion a lot sooner, but at least I got here eventually. Sorry, useless to me. Downloaded twice at different times. Even after a reboot and cleaning temporary files, the msi installer errors out with a 2203 error (Win 7 Ultimate 32-bit), all system and MS files up to date. Something seriously wrong with today's GOTD software somewhere! Sorry, useless to me. Downloaded twice at different times. Even after a reboot and cleaning temporary files, the msi installer errors out with a 2203 error (Win 7 Ultimate 32-bit), all system and MS files up to date. Something seriously wrong with today's GOTD software somewhere! Windows 7: The installed result is apparently the Pro version although it is not labelled 'Pro' in the title bar and in lieu of (instead of) access to download templates from their website store, they have given us an additional 13 templates in the .zip file download (in the product description at the top of this page). After the extra templates are merged into the program's 'Template' folder there are 21 templates + 2 postcard templates and they actually look quite good to me*. Templates are just a starting point and as mentioned there are editing features so one can modify or create their own templates. This is how I moved the extra templates into the program folder. (Windows 7). Open C:/Users/(current or main user)/AppData/Roaming/SpringPublisher/ Here you will see the 'Template' folder but don't open it. For those criticizing the appearance of the templates; Please consider applying yourself to creating something you like or employ someone else who can apply that energy or creativity. Don't expect software to sit in your chair and create everything you desire with a few mouse clicks. Of course you are not going to get the most exotic, professional or personalized artwork in the world in a software template. Although some of these templates are quite nice and may be adequate it's up to you to put together what is best for your needs. Thank you SpringPublisher Team and GOTD. Windows 7: The installed result is apparently the Pro version although it is not labelled 'Pro' in the title bar and in lieu of (instead of) access to download templates from their website store, they have given us an additional 13 templates in the .zip file download (in the product description at the top of this page). After the extra templates are merged into the program's 'Template' folder there are 21 templates + 2 postcard templates and they actually look quite good to me*. Templates are just a starting point and as mentioned there are editing features so one can modify or create their own templates. This is how I moved the extra templates into the program folder. (Windows 7). Open C:/Users/(current or main user)/AppData/Roaming/SpringPublisher/ Here you will see the 'Template' folder but don't open it. In a different window EXTRACT the downloaded zip file and then open the folder. You will see another 'Template' folder- Just drag and drop this template folder into the Spring Publisher window which contains the original 'Template' folder. Click YES to 'Merge' the Template folders. Now the new template files will be included when you open the SpringPublisher program. If you don't want to bother to integrate these files can click on any of the additional templates from the zip folder and they will open in the program *I'm 62y.o. and owned/managed a small commercial construction corporation in the 1980s. I designed all of the essential company forms myself, from stationary to contract forms using a multiple font electronic typewriter, a Kroy lettering machine that would produce a single line of text in a chosen font/ size on a piece of tape (used to create larger type for headers and such). I used ruler to measure, real scissors to cut and real glue to paste onto a layout sheet in the same way that print shops did layout work before sophisticated computers &amp; software came into use. That's where the term 'cut &amp; paste' originated and I'm sure that some print shops still use some manual layout methods for some of their work. (There are qualities of human perception, creativity, artistic ability and 'human touch' that computers will never be able to duplicate) I would then take that master copy to a print shop, select the nice paper with the grain and tone I wanted. For forms that required less quality and only a small number I would use a photo copy machine or for larger quantities and high quality print I could have the print shop burn a plate and print the order on an offset press. (considerably higher quality than computer printers for those who want the most professional result) For those criticizing the appearance of the templates; Please consider applying yourself to creating something you like or employ someone else who can apply that energy or creativity. Don't expect software to sit in your chair and create everything you desire with a few mouse clicks. Of course you are not going to get the most exotic, professional or personalized artwork in the world in a software template. Although some of these templates are quite nice and may be adequate it's up to you to put together what is best for your needs. I am now medically disabled, no longer run a business or have a job. I honestly can't afford to buy this software but It looks like fun. I look forward to exploring some creativity and maybe I can help someone else with a small business start-up. I made a very official looking business card with an old Civil War era 1860's official government seal (in color) and it looks very impressive. I'm a time traveler now, all I need is a horse and an 1860's gun. That reminds me of an old television series circa 1957-63 about a hired gunman named 'Paladin' who sent out his business card or 'calling card', "Have Gun, Will Travel" Here is what the card looked like along with his photo and theme song lyrics: http://www.tvacres.com/greetings_paladin.htm Thank you SpringPublisher Team and GOTD. I tried several times to get it to install. I could download it, and even extract the files but it would not install. I had to go in an delete the whole thing and start over. After doing this for about the third time I finally got it to install. But when the pop up box appeared where I was to put the registration code I found the button to upgrade to the pro version. The problem was that every time I clicked the upgrade button all I got was a screen wantingh to charge me nearly $24.00 with no way I could find around this. So apparently I am stuck with the non-pro version. I don't know if there is a way to get around this and still install the pro version or if I should uninstall it and try again. So a thumbs down for me. Have a proper installer in the GOTD file. It may be ok for games as is, but we expect more for a software program than to have to search for the extracted folder and then run the setup! Can't even find program to launch it. Great! I think I can use this, lot of useful features! Thanks! Thanks a lot with this puzzle. Jay! Thanks a lot with this puzzle. This is great software for designing business cards. I've used the previous version to create about 8 different business card designs. The output is saved in "full bleed" version (and also cut) which is what you need when submitting to VistaPrint and other places that print. I've never used the included templates. Instead have imported my own images, and used the built-in shape generator and text insertion. This program does layers and has opacity settings for each object in the design. (I didn't know that MS Word could do layers - regarding people here saying to use Word etc.) If you don't know how to use layers in a graphics program then you probably won't be able to do anything very useful with this program. This latest version also has a QR code generator with 4 different error correction codes you can choose from. I haven't seen any other publishing software that has this capability before. This is great software for designing business cards. I've used the previous version to create about 8 different business card designs. The output is saved in "full bleed" version (and also cut) which is what you need when submitting to VistaPrint and other places that print. I've never used the included templates. Instead have imported my own images, and used the built-in shape generator and text insertion. This program does layers and has opacity settings for each object in the design. (I didn't know that MS Word could do layers - regarding people here saying to use Word etc.) If you don't know how to use layers in a graphics program then you probably won't be able to do anything very useful with this program. This latest version also has a QR code generator with 4 different error correction codes you can choose from. I haven't seen any other publishing software that has this capability before. After uninstalling with Revo Pro and deleting the license files from the C:\Users\Jim\AppData\Roaming\SpringPublisher directory, it finally registered. I'd really like to hear from the developer on many of the comments submitted. I just use3d the old version a week ago to create a fine looking business card and letterhead After uninstalling with Revo Pro and deleting the license files from the C:\Users\Jim\AppData\Roaming\SpringPublisher directory, it finally registered. All templates now appear Talk about exasperating!!!!! I'd really like to hear from the developer on many of the comments submitted. Why does everybody hate the .NET Framework? It's an excellent developer's tool (that multithreading API is great) and also standardizes the function of applications across version of the Windows operating system. It even runs on UNIX (if Microsoft hasn't lied to me). LaTeX truly is the masters tool for typesetting. In universities it's a default writing tool for Mathematicians & Computer science geeks alike ; ) For those unknown to it - remember old Word Perfect in MS-DOS? You remember the underwater screen which showed all make-up codes? Well, with LaTeX one writes in codes. Then one compiles it and voila: one looks like a real expert. LaTeX is the ONLY format in which the American Mathematical Society allows publications. LyX is a front-end for every OS that takes away the need to know this programming language. Mailing labels, CD/DVD labels, business cards, dividers, t-shirt transfers, etc. Includes step-by-step Wizard, 600+ Avery product templates, hundreds of images, photo editing tool, mail merge, postal bar codes, and much more. Frame-oriented combination of spreadsheet, text processing & rich layout capabilities of DTP. Design photo albums, travel diaries, invitations, budgetary plannings, financial statements for associations, ... A single convenient layout environment in which you can process text, tables, drawings, pictures and graphs. Great tip :> Never thought of OpenOffice for drawing (& DTP). But you were right, excellent choice. Download the regular OpenOffice installer, and select the components which you want. Grmbl. I already had this program, but put it with Drawing Suites. But you were right - it can do DTP too! Inkscape is based on 'Scalable Vector Graphics'. And it is VERY complete! are you serious? this is a PRO version? I prefer Illustrator and Photoshop and if you need a free version, try Gimp. please do not tell me it is too complicated, if you want PROFESSIONAL results you need more than this less than basic application. you can get better results with Powerpoint than this useless thing. PRO? do not make me laugh. are you serious? this is a PRO version? I prefer Illustrator and Photoshop and if you need a free version, try Gimp. please do not tell me it is too complicated, if you want PROFESSIONAL results you need more than this less than basic application. you can get better results with Powerpoint than this useless thing. PRO? do not make me laugh. This has got to be the worst piece of software that GOTD has offered. Usually things go well but with this piece of junk I can't install I just seem to be in a unzip loop. Even when it's unzipped and I click on the install icon I get the unzip process again and again and again and again (on and on and on) I even tried to open as administrator but no luck. The software that is usually offered by GOTD is of high quality (even if it is not always what I can use) but todays offering is much below the usual high standard. Sorry for the negative review. BUT, a great big thank you for all that you normally offer to us. I now have the original ten plus the new 13 templates (23 total)!! Thanks!!! #47 mathymarge, Thanks! In XP, I copied the files from each new template folder into the corresponding folders in Documents&amp;Settings\User\ApplDat\SpringPublisher\Templates\. . . I now have the original ten plus the new 13 templates (23 total)!! Thanks!!! I decided to download right from their web site. I did the same process, installed, and ran the program. Now the program shows version 2.5.5 I tried to register this version with the same GOTD code, but it comes back as "Invalid Code". Visiting the site further, it states that version 2.5.5 is a free upgrade for all users who have version 2.x, so maybe this means I don't have to enter a new registration code. I don't see anywhere in the Templates to click to see the "Online Templates" that have been referenced in previous posts, but there are now an "Insert Map" and "Insert QR Code" buttons, which I don't remember in the old version. There appear to be a few more templates included in the installation. I haven't installed the extra template package yet, so I can't comment on their appearance. I think this program will be very useful to people who casually need a professional looking newsletter or business card, ie. social clubs with few members. The QR code is easily created with the button, and can be re-sized to just about any size you like. Maps are inserted using Google Maps. It comes with a variety of shapes that are easily manipulated & colored. Although a very specialized program, it does seem to perform very quickly and with the added QR generation and map insertion, I think it can be a very useful little program for those who need it. I'm keeping it, although I think the company needs to work on the registration process. I decided to download right from their web site. I did the same process, installed, and ran the program. Now the program shows version 2.5.5 I tried to register this version with the same GOTD code, but it comes back as "Invalid Code". Visiting the site further, it states that version 2.5.5 is a free upgrade for all users who have version 2.x, so maybe this means I don't have to enter a new registration code. I don't see anywhere in the Templates to click to see the "Online Templates" that have been referenced in previous posts, but there are now an "Insert Map" and "Insert QR Code" buttons, which I don't remember in the old version. There appear to be a few more templates included in the installation. I haven't installed the extra template package yet, so I can't comment on their appearance. I think this program will be very useful to people who casually need a professional looking newsletter or business card, ie. social clubs with few members. The QR code is easily created with the button, and can be re-sized to just about any size you like. Maps are inserted using Google Maps. It comes with a variety of shapes that are easily manipulated &amp; colored. Although a very specialized program, it does seem to perform very quickly and with the added QR generation and map insertion, I think it can be a very useful little program for those who need it. I'm keeping it, although I think the company needs to work on the registration process. I`m a "victim" of a previous installation of a similar program like SpringPublisher (or the same), lmao. So the templates were already there. After you install the program you will have 10 different templates/sets, after copying the other one`s you will end up with 23 different templates/sets. The same is for the Upgrade To Pro button, that will not appear, if you have a uninstalled previous activated version of the program (like me), because the license file was still present on my comp and valid from the older one. C:\Users\YourName\AppData\Roaming\SpringPublisher is the folder for the new Templates and where the information of registration will be stored. I thought I was having problems installing this program until I read comment #16 when I realized I already had a version of this software. After running the set-up, I tried to register it with the code, to which I got the error. That was because I was trying to register the OLD program which doesn't have the Template Button that is being referenced in the new program. So I uninstalled the old and ran the Set-up file again. The program didn't install. 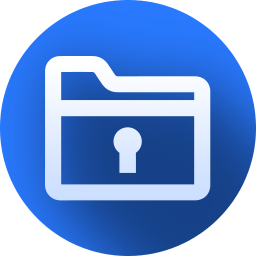 What it does do is create a new folder in the Programs file and simply extracts the zipped files into it. "Set-up" does NOT set-up. You have to go to the folder and click on the "SlimPublisher.msi" file to actually run the installation program. After running, I tried to register this new version. It still didn't work. Then I noticed the version number. It's still version 2.3, not the new 2.5.5 Pro we're supposed to be evaluating. Not being a guru, I'm not sure what I'm doing wrong or why this installation and registration is such a complete mess. At this point in the computer world, I expect updated programs to look for their older versions on a system and to automatically uninstall or update as needed. At the very least I expect to be informed that there is an older version that needs to be removed. I am trying to download the program right from their site now to see if that is the Pro version that is being referenced as a GOTD. Right now I'm really annoyed with this developer. As for the OLD version of the program, as others have said, it is a very simplistic and specialized piece of software. I'm not sure how useful it will be be to a user. 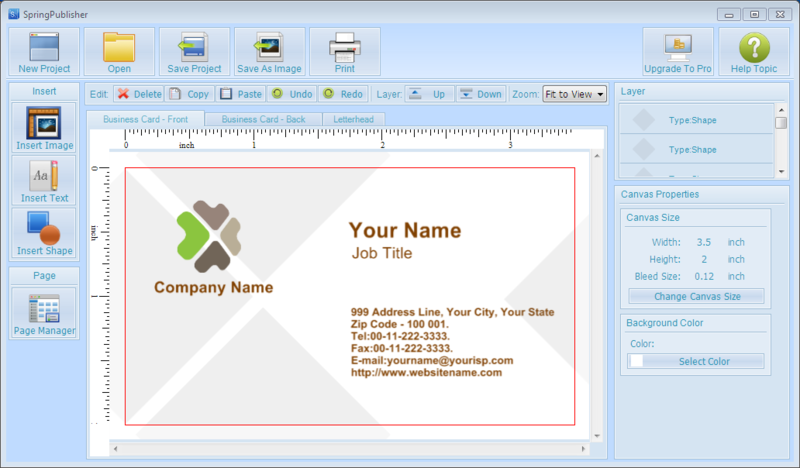 A person could create a business card easily with other free software & free templates from Avery, Microsoft, or other vendors (as stated before) and have them professionally printed (home printing would look too unprofessional as most people are using standard printers with water soluble ink). It's a program that might come in handy for those do-it-yourself-ers out there or people who would like to create a personal card to exchange in social situations, but I think any professional who needs a business card will prefer to have one professionally designed and printed. I thought I was having problems installing this program until I read comment #16 when I realized I already had a version of this software. After running the set-up, I tried to register it with the code, to which I got the error. That was because I was trying to register the OLD program which doesn't have the Template Button that is being referenced in the new program. So I uninstalled the old and ran the Set-up file again. The program didn't install. What it does do is create a new folder in the Programs file and simply extracts the zipped files into it. "Set-up" does NOT set-up. You have to go to the folder and click on the "SlimPublisher.msi" file to actually run the installation program. After running, I tried to register this new version. It still didn't work. Then I noticed the version number. It's still version 2.3, not the new 2.5.5 Pro we're supposed to be evaluating. Not being a guru, I'm not sure what I'm doing wrong or why this installation and registration is such a complete mess. At this point in the computer world, I expect updated programs to look for their older versions on a system and to automatically uninstall or update as needed. At the very least I expect to be informed that there is an older version that needs to be removed. I am trying to download the program right from their site now to see if that is the Pro version that is being referenced as a GOTD. Right now I'm really annoyed with this developer. As for the OLD version of the program, as others have said, it is a very simplistic and specialized piece of software. I'm not sure how useful it will be be to a user. A person could create a business card easily with other free software &amp; free templates from Avery, Microsoft, or other vendors (as stated before) and have them professionally printed (home printing would look too unprofessional as most people are using standard printers with water soluble ink). It's a program that might come in handy for those do-it-yourself-ers out there or people who would like to create a personal card to exchange in social situations, but I think any professional who needs a business card will prefer to have one professionally designed and printed. I installed the program, and tried it; the program is to hard on my eyes. I will be staying with my printshop; thank you springpub and giveaway team. Hi all, well I was interested in trying out this appy, but I don't know what I ended up with. Please let me explain; I dl'd it followed the instruction (official ones) then tried some of the other suggestions (thank you all) but with limited/questionable success/failure. It didn't create any shortcuts and like someone else said it called itself "slimpublisher". I could not find anywhere to register or info on how to add the templates also offered for dl on GOTD. I even followed the suggestion of another person (above) re uninstalling and then reinstalling (thx) but that didn't work either. BTW I used "search everything" to find the .exe and that is how I finally was able to run the appy. My PC runs win7 Pro 64bit with 12 gigs RAM, I have 2 1 gig Nvidia 4600 in SLI and for what its worth 8T of SCSI HD and one SSD for my OS. I don't know if that info helps the developer, but maybe it does. At the end of the day, I can't tell what version was installed, (not even an 'about' button). So, I will continue to try (whatever it is that I got) but I feel pretty sure it won't be staying on my PC for much longer. P.S. Dear developer, a bad install process does not inspire ppl to purchase products from any supplier, install routines are pretty simple to construct, but an appy takes a lot more skill to be good and reliable, this kind of experience will leave some ppl with a very negative feeling about your offerings. Hi all, well I was interested in trying out this appy, but I don't know what I ended up with. Please let me explain; I dl'd it followed the instruction (official ones) then tried some of the other suggestions (thank you all) but with limited/questionable success/failure. It didn't create any shortcuts and like someone else said it called itself "slimpublisher". I could not find anywhere to register or info on how to add the templates also offered for dl on GOTD. I even followed the suggestion of another person (above) re uninstalling and then reinstalling (thx) but that didn't work either. BTW I used "search everything" to find the .exe and that is how I finally was able to run the appy. My PC runs win7 Pro 64bit with 12 gigs RAM, I have 2 1 gig Nvidia 4600 in SLI and for what its worth 8T of SCSI HD and one SSD for my OS. I don't know if that info helps the developer, but maybe it does. At the end of the day, I can't tell what version was installed, (not even an 'about' button). So, I will continue to try (whatever it is that I got) but I feel pretty sure it won't be staying on my PC for much longer. P.S. Dear developer, a bad install process does not inspire ppl to purchase products from any supplier, install routines are pretty simple to construct, but an appy takes a lot more skill to be good and reliable, this kind of experience will leave some ppl with a very negative feeling about your offerings. Kind regards - Peter. @27 (Helen): Should you have read my post, you would have already download the Avery software made by the very same company that produces label papers. At some time they freely offered their software in order, I guess, to improve the sale of papers. Now, they're connected to the Internet so they're able to offer web services instead, and have concluded agreements with Microsoft and Corel. Easy install and registration, just read the readme.txt that always comes with the GOTD offerings. I love this program, I am use to MS Publisher and this is a much easier program to use. The templates it comes with, sorry to say, are awfull. But what I love this program is that it allows you to use your own picture/graphic files and allows a 2 sided business card. I haven't tried to print anything yet, that is the only part that might be questionable, if it will print on the blank sheet of cards that I have. I wasn't sure about this program after reading the other comments, but I am glad I downloaded it. Downloaded and installed and registered without problem. But this is a terribly simplistic Desktop Publishing program and doesn't even provide for adding text on a path,i.e. on a circle, etc. Not worth keeping on my computer let alone purchasing. Downloaded and installed and registered without problem. But this is a terribly simplistic Desktop Publishing program and doesn't even provide for adding text on a path,i.e. on a circle, etc. Not worth keeping on my computer let alone purchasing. Corel draw in 1996 had a better looks and more useful templates than this one. It is an insult on us (more advanced users)to even try to design anything on this outdated software. Corel draw in 1996 had a better looks and more useful templates than this one. It is an insult on us (more advanced users)to even try to design anything on this outdated software. Uninstalled. Launch Spring Publisher, choose Upgrade To Pro in the top Right corner of the main screen. Use the provided key to register your copy. Jay (#5), the readme file has the info that would have helped you: Launch Spring Publisher, choose Upgrade To Pro in the top Right corner of the main screen. Use the provided key to register your copy. Hmmm. I also did not get an install pro option when installing. Followed @5 Jay's directions (seem to remember this as what was needed last time). Accepted the registration, but still does not show as "Pro" however it will print 350 dpi, so must be Pro as that was one of the differences between free/pro. Have tried the M$ Word templates for 2010, and find this very simple program easier to get 6/9 cards of same size printed. I found Word to be easier to get the bits of the cards in the right place and of the right size. However being half-simian and good at trial and error, I made my cards using Spring. Can change colors shapes etc with not too much hassle. No experience with the other progs or trying to use this for newsletters or other stuff. I use Word for most of that or going to Quark or Pagemaker for heavy duty (and expensive) pubs. Thanks GAOTD and Spring. I recommend it for doing fairly quick, good looking business cards. Hmmm. I also did not get an install pro option when installing. Followed @5 Jay's directions (seem to remember this as what was needed last time). Accepted the registration, but still does not show as "Pro" however it will print 350 dpi, so must be Pro as that was one of the differences between free/pro. 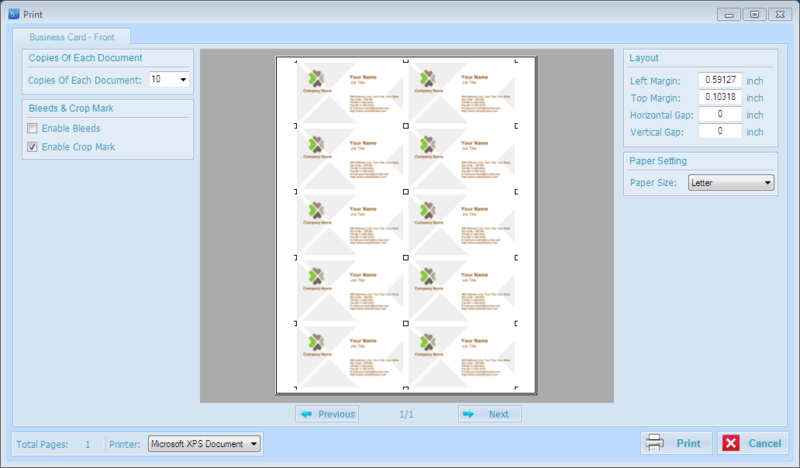 Have tried the M$ Word templates for 2010, and find this very simple program easier to get 6/9 cards of same size printed. I found Word to be easier to get the bits of the cards in the right place and of the right size. However being half-simian and good at trial and error, I made my cards using Spring. Can change colors shapes etc with not too much hassle. No experience with the other progs or trying to use this for newsletters or other stuff. I use Word for most of that or going to Quark or Pagemaker for heavy duty (and expensive) pubs. Thanks GAOTD and Spring. I recommend it for doing fairly quick, good looking business cards. Anybody knows the difference between this one and SlimPublisher(http://www.binarynow.com/products/slimpublisher/)? I had them both installed and it is exactly the same product. Why 2 different companies? Seemed to install OK, but there is no "upgrade to pro" option in the upper right corner, so I cannot enter my license code. I even tried XP compatibility mode on my 64-bit Win 7 computer, but still no joy. Unless someone can come up with a fix for this, I will have to remove. Will check back later to see if anyone has any suggestions. Thanks. Further to my comment #27, I found out the problem! I had an old (Nov 2011) ver of SLIMPUBLISHER 2.3 installed. When I uninstalled that AND todays giveaway (Which shows SlimPublisher 2.5.5 on header!). I then reinstalled todays GAOTD and it now shows the upgrade to pro and also the header shows SPRINGPublisher..
Further to my comment #27, I found out the problem! I had an old (Nov 2011) ver of SLIMPUBLISHER 2.3 installed. When I uninstalled that AND todays giveaway (Which shows SlimPublisher 2.5.5 on header!). I then reinstalled todays GAOTD and it now shows the upgrade to pro and also the header shows SPRINGPublisher.. Case closed!!! Had it not been for "devnullius" enter, I would never had it registered. I didn't want to upgrade, therefore would never have thot to press that option. Thanx. After seeing that the description was written by a 3 year old, or a person for whom English is a third language, and since I use PrintMaster and have never found anything better I declined to even download this one. Thanks anyway. ohh looking in the interface is painful to my eyes. Part Deux: My solution: fully uninstall, then reinstall. NOW the button appears. SpringPublisher = again a 1-Way-Trash-Software. Programmer has spend more brain into Online-Hardware-Fingerprint to safe the Lizense, instead investing time and brain to bring his application over the lever from a children-gimmy. Ok, @16 GOTD Team, the go pro button doesn't appear and you have given a reason why, so how do I/We/You resolve this issue? Thank you very much in advance for your time and trouble in the timely resolution of this issue. Ok, @16 GOTD Team, the go pro button doesn't appear and you have given a reason why, so how do I/We/You resolve this issue? Thank you very much in advance for your time and trouble in the timely resolution of this issue. Also I don't see any 'Upgrade to Pro' on my Win7 x64 system, so I can't input the license info. So I am just left with the 'FREE; version. Why does the window header show 'Slim Publisher 2.3'? Program is located under SlimPublisher in my Win menu too! Makes it hard to find:)- Also I don't see any 'Upgrade to Pro' on my Win7 x64 system, so I can't input the license info. So I am just left with the 'FREE; version. @5. Uhhmm did you noticed, that you need credits for downloading templates from the "Web Store"? I don`t think that they name it "store" just for fun, if everything would be downloadable for free there. As for the additional templates: They are ALREADY INCLUDED and AVAILABLE with the installation, so why tag them as additional or "full set" if you just replace the already existing one`s? I don`t get it. I would understand that additional means other one`s than the already existing one`s but they aren`t, they are the same?!? Does anyone know of a good FREE business card maker?